Křeč is a village and municipality (obec) in Pelhřimov District in the Vysočina Region of the Czech Republic. The municipality covers an area of 10.4 square kilometres (4.0 sq mi), and has a population of 225 (as at 3 July 2006). 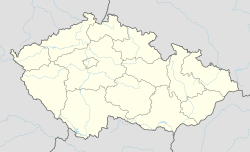 Křeč lies approximately 23 kilometres (14 mi) west of Pelhřimov, 49 km (30 mi) west of Jihlava, and 87 km (54 mi) south-east of Prague.